Just a quick reminder that tomorrow is the last day for orders placed off of your wishlist to count towards a free shopping spree for you in January. Check out this blog post for all the details and then make sure you’ve shared your wishlist with me and all your family and friends! They will get exactly what you are hoping for plus be earning you an additional free gift certificate to shop with in January! Orders can be placed directly through me or via my online store. However, any orders placed online must be accompanied with an email indicating they were purchasing off of your wishlist so that I know to give you credit. Cyber Monday Special – 15% off your entire order! I hope you’ve been having a great holiday weekend and managed to snag some great deals. Well, today is the day known as “Cyber Monday” with extra online sales to finish out the holiday weekend. So, through Monday only, get 15% off your entire order! No minimum purchase; just a little extra money in your pocket. Want to get this extra savings? Email or call me with your order. Since I don’t have a way to provide the discount to online orders, anyone who orders online will instead receive a gift certificate worth 15% of your total order. Email me at jennifer@nwstamper.com or call 425-765-6197. 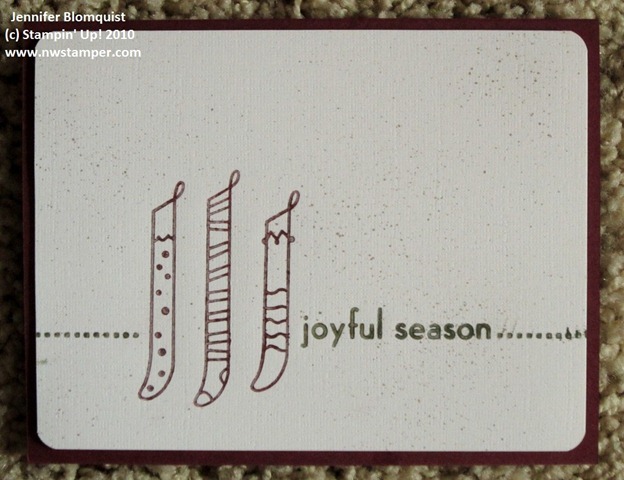 Today I thought I’d share the final card from my Holiday Stamp-a-Stack last weekend. I wanted to get away from the traditional reds and greens and ended up playing with some blues instead. 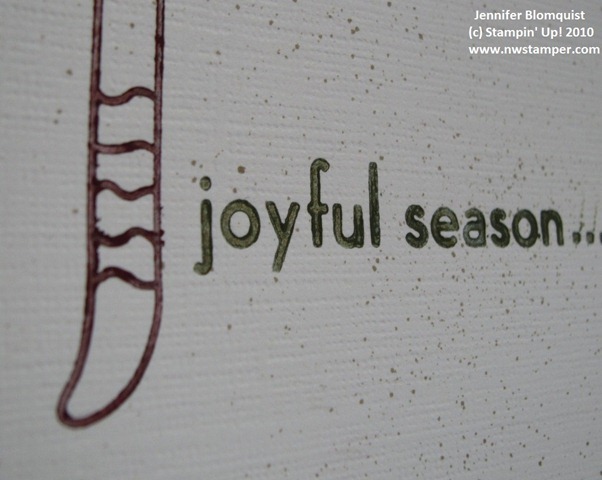 I don’t know why I always forget about using white craft ink on cardstock, but thanks to a sample I saw on the demonstrator Stampin’ Connection site, I knew i just had to have some white snowflakes. 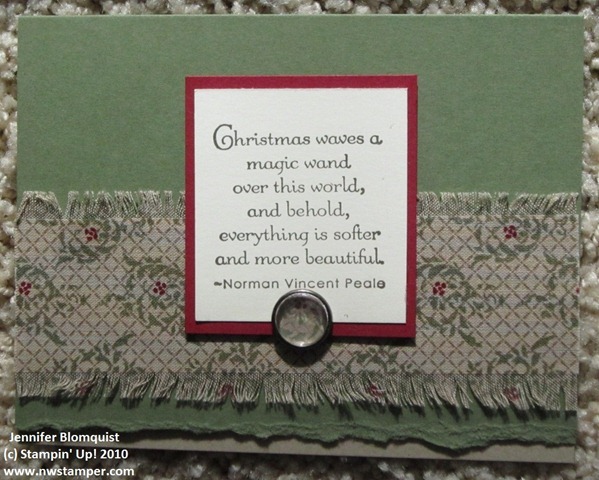 I also had seen some layering of ribbon with the Dotted Scallop Ribbon Punch and wanted to try that as well. 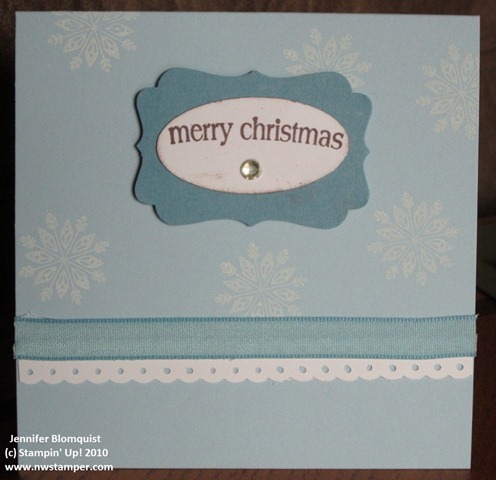 So, we ended up combining Whisper White, Bashful Blue, and Marina Mist to make this cute little winter flurry card. Ok, you know I’m a sucker for sales and I figure if I like a sale, you might too. So, in the tradition of Black Friday specials, I wanted to have a special offer for you too. With any size order– get free shipping! Placing an order of $150 or more? Get a free pack of designer series paper of your choice! To receive these special offers, you must email or call me with your order by 11:59 pm PST on 11/26. This special is only available through me and can be combined with any other current promotional offers.. Contact me to take advantage of this Black Friday special at jennifer@nwstamper.com or (425) 765 – 6197. I wanted to take a moment to wish you all a very Happy Thanksgiving! I am so thankful for my family, friends, and the wonderful community of crafters I have had the privilege of becoming a part of since discovering stamping and Stampin’ Up! And I am thankful for all of YOU! Your comments, encouragement, and visits to my blog really bring joy to my life. So thank you.! 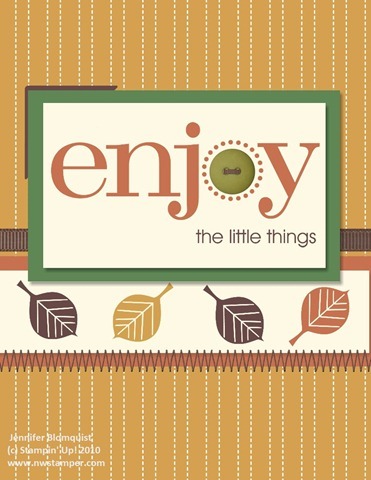 I ordered the new Designer Fabrics a long while back as part of a special for Stampin’ Up! convention attendees and was excited to try experimenting with incorporating fabric into my projects. Well, I kept looking at the pretty fabric sitting on my shelf and couldn’t bring myself to cut into it (ok, and I’ll admit I was a little intimidated to try something different). But after my friend kept asking me about the fabrics, I knew i needed to break them out and just start cutting! So, this card was a fun way to play with the fabric, experiment with fraying the edges (since I had seen a few cards that did this to a very cute effect), and then also use the matching designer series paper as an accent in the Build-a-Brad. Side note – for those of you who have no idea what I’m talking about when i say “Build-a-Brad”, it is that brad in the center of the card. What makes these brads cool, is that they come as a blank flat-topped brad. They are meant for you to punch out any paper/stamped image using a 1/2” circle punch and adhere that punchout to the top of the brad. Then you can use the provided clear adhesive-backed plastic pebble to make the brad looked finished. I started with the idea of using the fabric and fraying it. Then I added the Build-a-Brad. I had the card done and all ready for the class when I looked at it and said, “Its so vintage, I bet a torn edge would look cool”. So, I tore the bottom edge of the card, which looked cool but really popped when I added some Crumb Cake cardstock to the bottom of the card inside. This card probably took the longest to make, but I love its fun accents and vintage feel. When we adhered the DSP to the top of the brad, I like to use Crystal Effects as my glue as opposed to Snail or Glue Dots because you can get a flat even coating of the adhesive on the brad top and you know it won’t slide around on you in the future. To adhere the fabric onto your cardstock, your best bet is probably going to be the Multipurpose Adhesive Sheets. But if you don’t have that (and we didn’t for the class), you can use sticky strip to do the job. 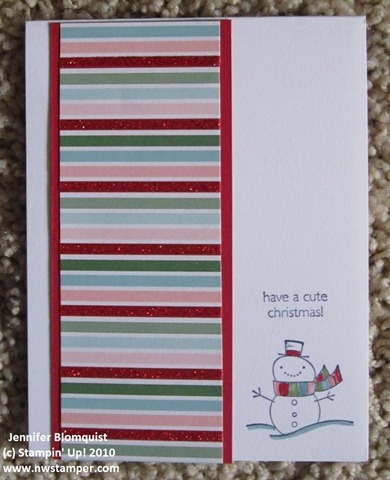 For this card, I recommend cutting your fabric and determining where you are going to lay it on your card. Cut a piece of Sticky Strip that is 1/2 – 2/3rd the height of your fabric piece and place it on the edge of the cardstock and then press your fabric onto the sticky strip. I found that if you tried to put sticky strip directly onto the fabric, it can be hard to get the red backing off the tape without pulling the tape strip off of your fabric at the same time. When fraying the edges of your fabric, only pull one or two threads at a time to minimize punching and pulling of your fabric. Pull extra threads for fraying by using the tip of your Paper Snips to separate the thread you are going to pull from the flat fabric piece. Don’t miss your chance to get the Designer Fabrics for 50% off! If you like the idea of playing with fabric in your projects, don’t miss your chance to try it out for half-off as part of the Online Spectacular sale. You only have until Nov. 30th, so don’t delay! Check them out HERE. Last Saturday was my latest holiday Stamp-a-Stack. Since I had a few folks who had been to my first class, I decided to shake things up and play with some new products and designs. Turns out, I love these cards and had so much fun sharing them with my ladies. So I thought I would share a couple of the cards with you today. I’ll be posting the other two cards we made here this week and would love for you to stop back by and let me know what you think! This next card was an excuse to use the Letterpress plates. One of my ladies had been curious about the Letterpress plates and so I thought I would give everyone a chance to try them out. 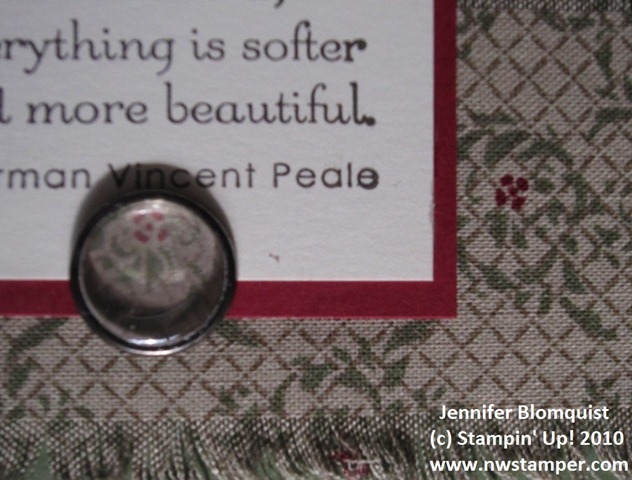 If you aren’t familiar with the letterpress dies, the way they work is that you ink up the raised image on the plastic plate using your ink pads (I personally love using the Craft Ink Spots). Place your paper over the inked image, and run it all through your BigShot or other die cutting machine. Your image is impressed into the paper and the ink is left behind in that impressed image. Here is my attempt at taking a photo close up to show you what I mean. Don’t forget to fill out your wishlist and get your FREE bonus gift certificate! With the Holiday Online Spectacular sale and my wishlist bonus offer going on this week, now is the perfect time to help your family and friends get their shopping done early! Your family and friends can save money on your favorite things through the Online Spectacular and you will get a free bonus gift certificate worth 10% of all the items purchased off your wishlist. Its a win/win! Email me your wishlist today to start earning your rewards.